I've had a few months since arriving home from Belgium, and my off season (which is turning into my pre-season) has had a few highs and a few lows. 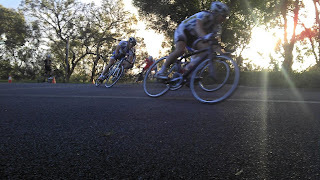 I jumped back into criterium season and finally managed to score an elusive win in A grade at Hawthorn's Wednesday night crit at Kew. A split of about 8 broke away from the bunch, and we earnt a comfortable lead by the time 3 laps were called. I jumped off the front, and didn't look back, whilst the others apparently looked around at one another to do the work to bridge the gap. Lucky for me, the hesitation left me enough time to pull off my first win on the road in A grade. 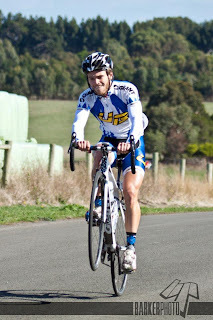 The Mt Buller Road Race was another successful outing, where I managed to score 8th place in A grade, just 1 minute off the winner, and 2 minutes off Simon Gerran's record up Mt Buller. The bunch stayed together until half way up, and I ended up getting the better of the 2nd group up the climb, nearly catching some SASI riders on the line. Unfortunately the past two outings on the road have been considerably less successful. Poor nutrition and water intake (compounded by a lack of high volume training) had me cramping up 1/2 way through the Baw Baw classic, and hitting the wall at the bottom of the climb. Not fun. 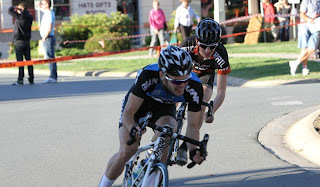 This weekend just past was the Tour of the South West in Warranambool, I was feeling a little crook, but hopeful I could hang on to the bunch for some decent training. Stupidly, I didn't even warm up, and I was almost dropped off the line. A bunch of ~6 caught back up to the peleton, but I was feeling awful, and ended up dropping off and riding with Clive from UB who'd punctured. We got a decent ride in anyway, rolling around for 100km at a reasonable pace, and managed to have a little bit of fun while doing it. Right now it's time to knuckle down and get some decent k's under my belt. I'm glad I'm discovering I'm not fit enough now rather than half way through CX season! I helped out with a women's only CX clinic held down at Darebin Parklands the other week, held by the Dirty Deeds Cx Crew. It was good fun, with a mix of experienced riders and newbies. There'll be another for all beginner's in May, keep an eye on the website for details. Australia will now have a CX National Series, with 2 races in Melbourne (July), 2 in Adelaide (August) and 2 in NSW (Sept? ), and state champs in September as well. There's going to be plenty more competition this year, with numerous talented mtbers, roadies and track racers getting CX bikes, so I'll have my work cut out for me! I'll just have to put my experiences to use! Sure this blog won't be as exciting considering I'm not racing overseas at the moment, but check in every now and then to see what I'm up to, and if you're in Melbourne, come and race CX!